Bazooka is back with new material, more dynamic and different than ever. 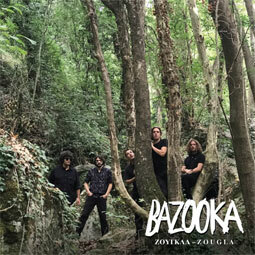 The tracks of “Zougla” (Jungle) EP are a breakthrough for the sound of the band and bridge the style of “Useless Generation” with the most psychedelic sounds of their self-titled debut album. From the tribal groove of the opening track “Zougla” and the acoustic dynamics of “Exailosou” to the scaled “I Diki Sou Sira” with its new wave passes and last but not least, the psychedelic references of “Thelo Fisi”, the sound of Bazooka – based once more on Greek verse – evolves. The band goes beyond limits and manages to sound disintegrated, chaotic but at the same time absolutely raw and impetuous.